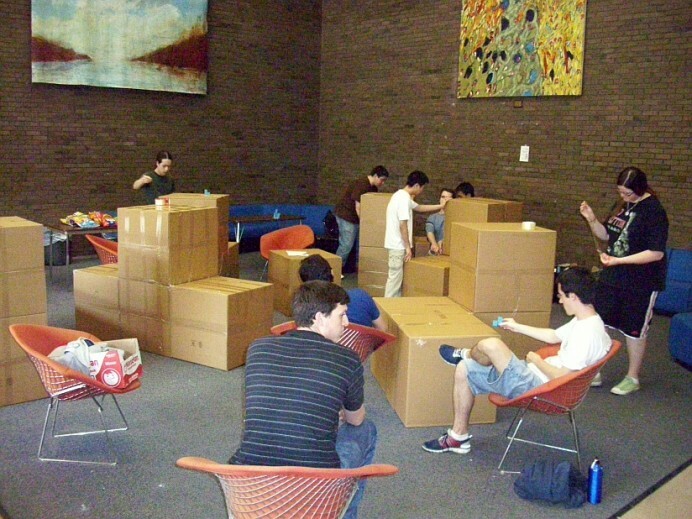 At the Museum of Mathematics, we have been developing exhibits and programs in preparation for our December 2012 opening. 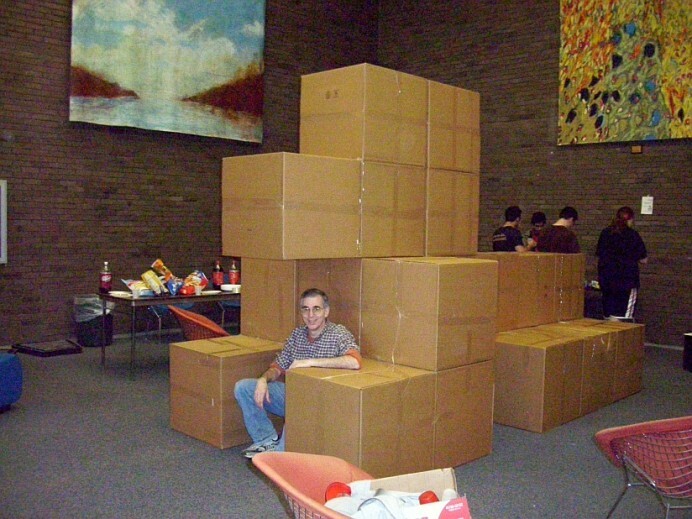 One program we like is a Giant Soma puzzle made of twenty-seven cardboard boxes, each a two-foot cube. 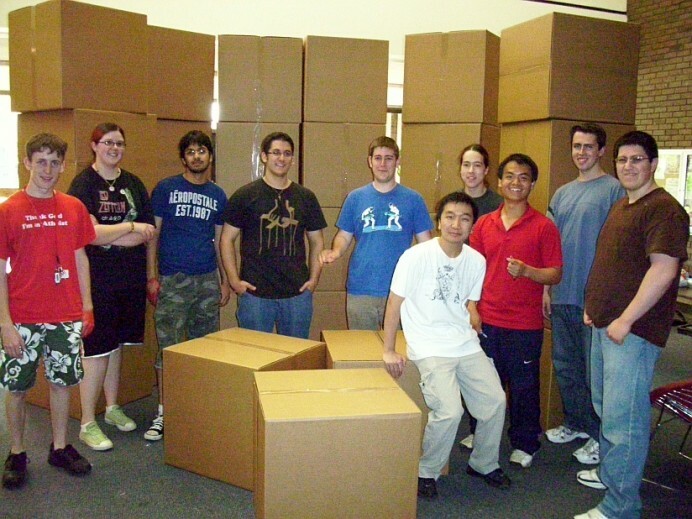 (This can be scaled down for younger groups.) 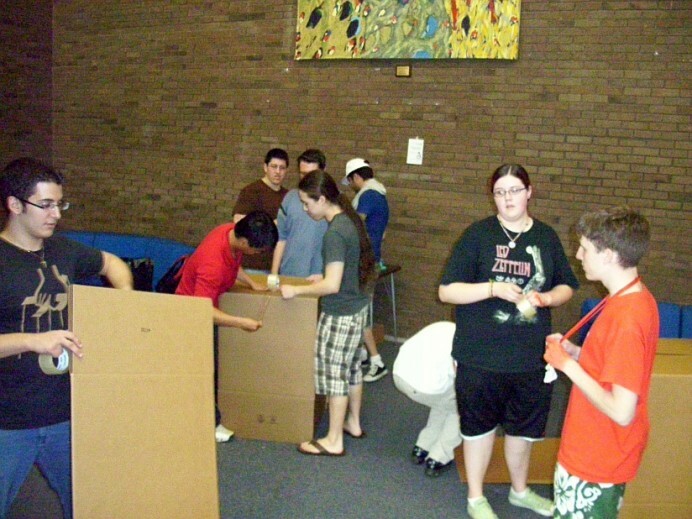 Participants first build the boxes and tape them together to make seven 3D puzzle pieces. 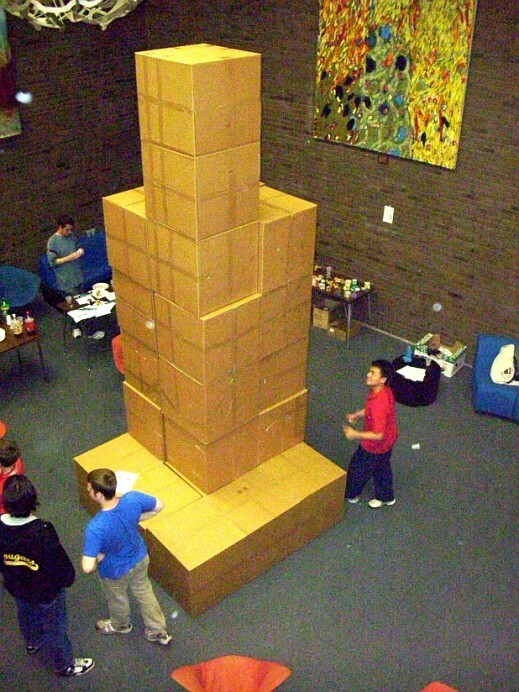 Then they work as a group to assemble the pieces into a number of challenge shapes, including a 3x3x3 cube, a sphinx, a tunnel to climb through, and a fourteen foot tall skyscraper. 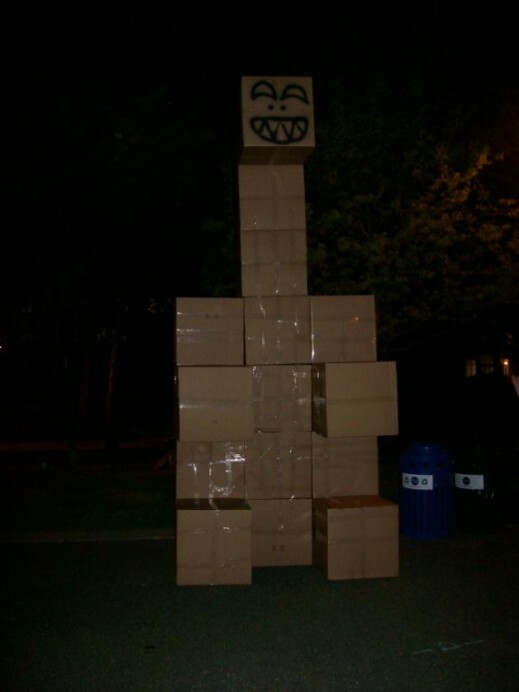 The boxes and tape cost about $100 all together. See below for detailed instructions. 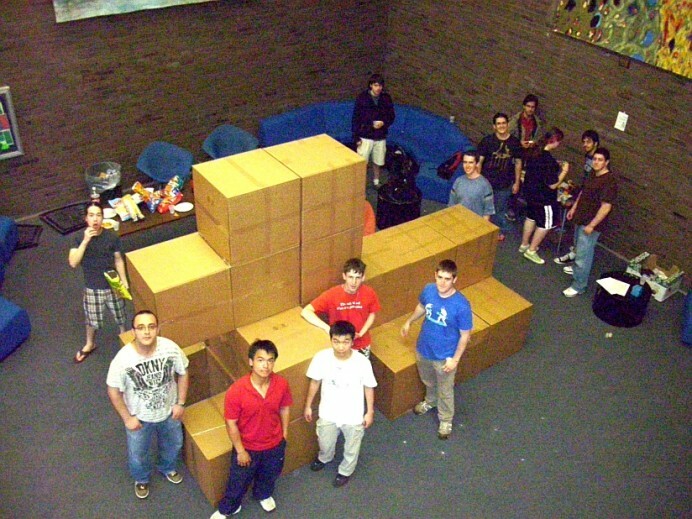 Start with twenty-seven cube-shaped boxes, lots of packing tape, and a group of helpers. 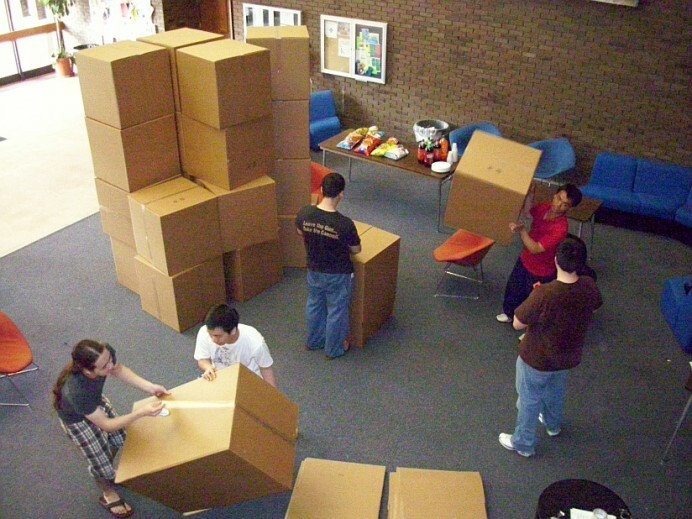 Phase 1 is to tape up the boxes into two-foot cubes. Neatness counts. Work in a big space. 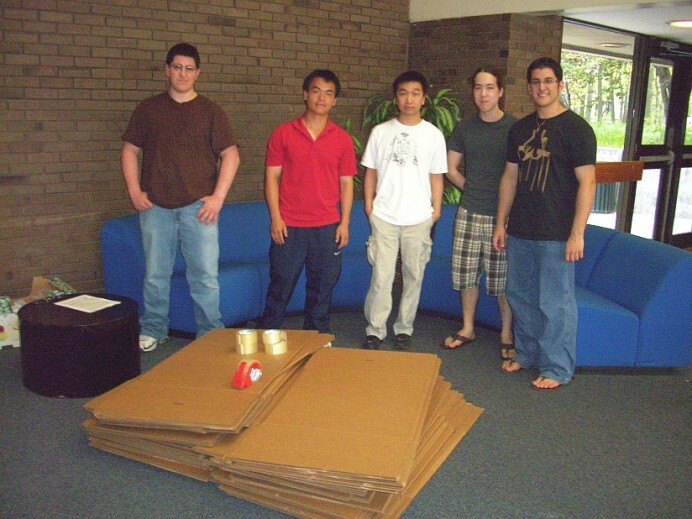 We’re in the Stony Brook University Computer Science building lobby. 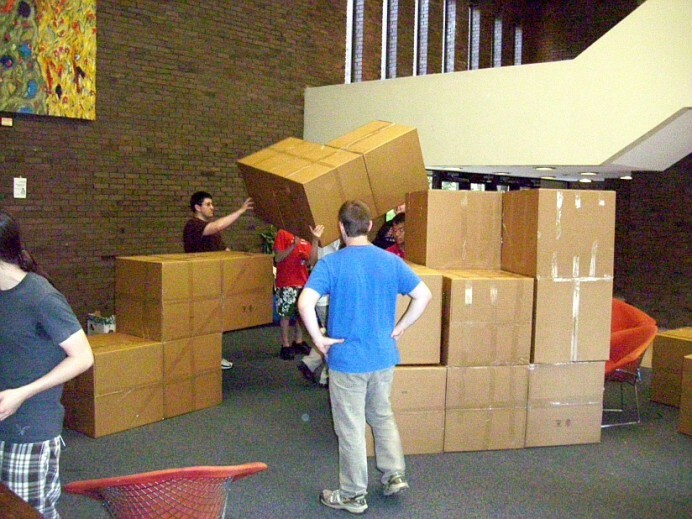 Phase 2 is to join cubes into the soma shapes, being careful to have each team do a different shape. Having a set of small models helps, especially for getting the two chiral ones correct. OK, all seven parts are done. End of phase 2. 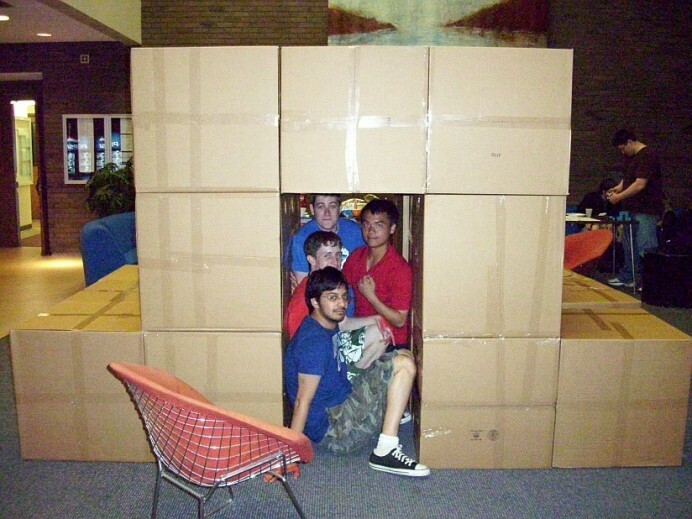 Phase 3: Build a 3-by-3-by-3 cube. 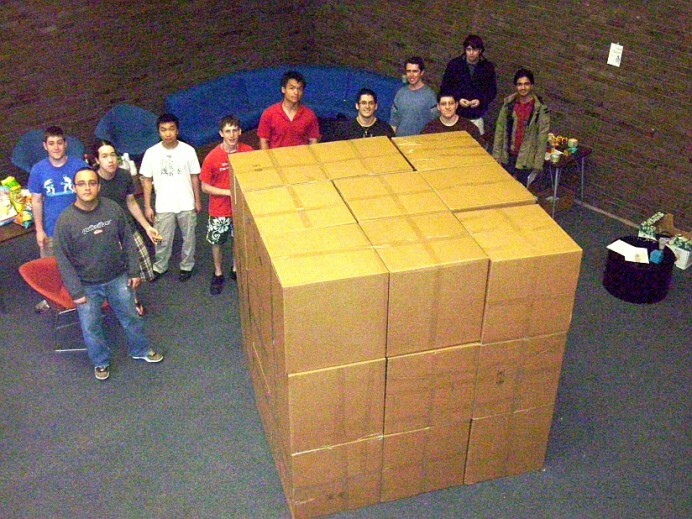 How hard can it be when there are 240 different solutions? 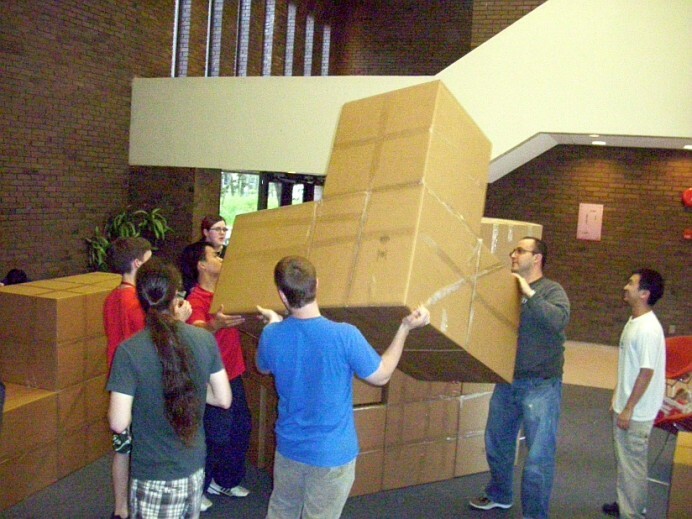 It is slower than you think, as each move takes group coordination and communication. 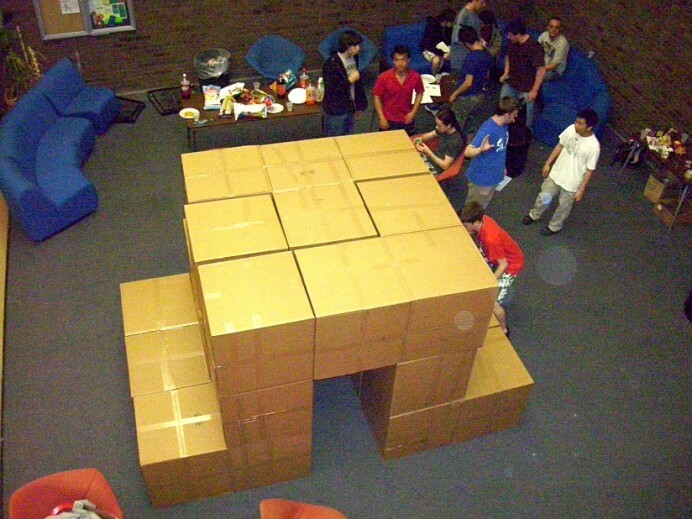 Phase 4: After the cube, there are lots of other challenges to try. This is either The Dog or The Sphinx, depending on who you ask. The top of The Skyscraper is pretty high. What to do? 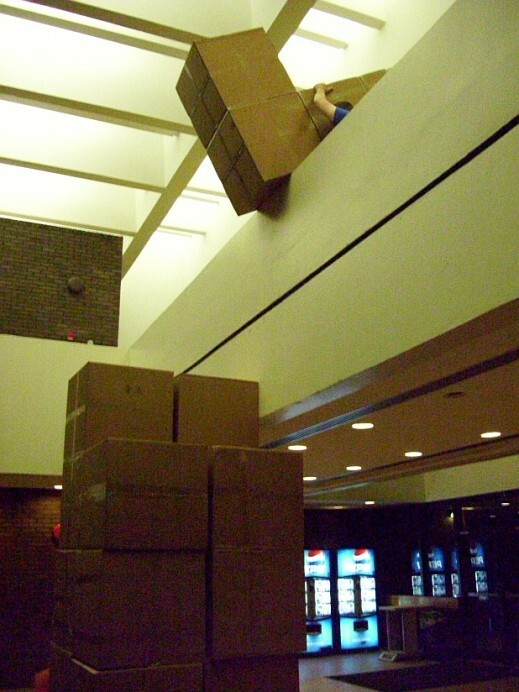 Luckily, there is a balcony around this lobby. The Skyscraper. 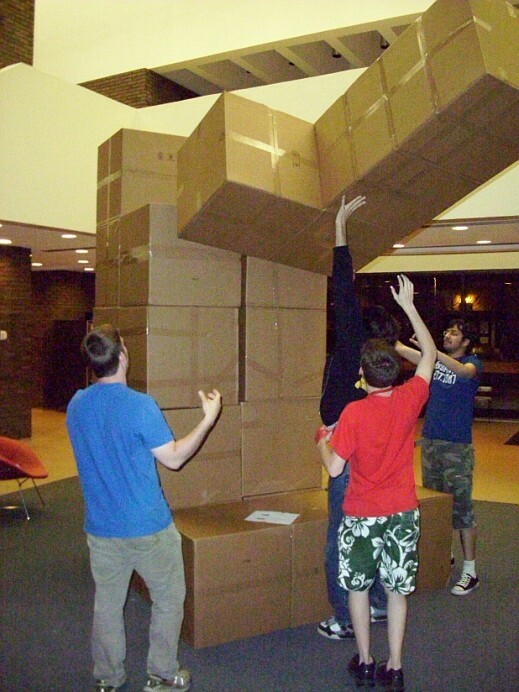 It’s fourteen feet tall. My favorite is The Sphinx.